Exciting things have been in the air at ACAF over the past few months. Once again ACAF Projects has been invited to the Contemporary Istanbul CI 2016 to present artists from the ACAF family. Working with ACAF Melbourne based curator Jeremy Gales on our two exhibits at the fair has been most rewarding. The first of the two shows curated by Jeremy is "Temperament of Continuity - works by Song Ling”. Song Ling is well known to ACAF members for his work in Australia as well as his seminal work in the contemporary movement in China. The second is a group show “Views on the Marmara, Views from the Propontis" featuring Australian, Chinese and International artists, including works from Jia Qiuyu (CN), Leela Schauble (AU), Ling Jian (CN), Li Wenguang (CN), Miao Xiaochun (CN), Monica Ferreras De La Maza (DR) and Yang Mian (CN) will be curated by Jeremy Gales (AU). One of the main aims of ACAF is to help artists develop their international profiles through exhibitions in new and growing artistic environments. Through ACAF Projects, our involvement in Istanbul has already been a rewarding exercise with a number of artists taking part last year finding a base of art lovers and collectors for their work. Despite the uncertainty in the region we feel that this is the time for art to play its part in showing solidarity with the people. Back in Melbourne we just had the ACAF sponsored exhibition “We Are All Here Now, Here In The Gallery” at the E+hive Art and Design Gallery in Melbourne. This is the first of a number of exhibitions ACAF is sponsoring in its mission to familiarise audiences in Melbourne with contemporary Chinese artists. In our next newsletter we will bring you up to date on our work in China, our many Arts Can Do projects with children of poor migrant workers and the development of ACAF Residency at our studio and accommodation space for the International and Chinese Artists Residency Program in Shanghai. Once again thank you for your continued interest and support. Continental Europe and Asia share Turkey in common. The Sea of Marmara connects Istanbul to the world and vis-a-vis. Formally the Propontis (Greek, Antiquity), the Marmara gazes both East and West. From antiquity, through the Hellenic and into the contemporary the sea has been shared by both. The canon of Euro-Asian art history encompasses much more than Turkey's Coastal regions, the arc is truly trans national. Each artist presenting in the show has at some point worked within the arc of the canon, whether it is a theme which underpins their practise or an issue they seek to address. 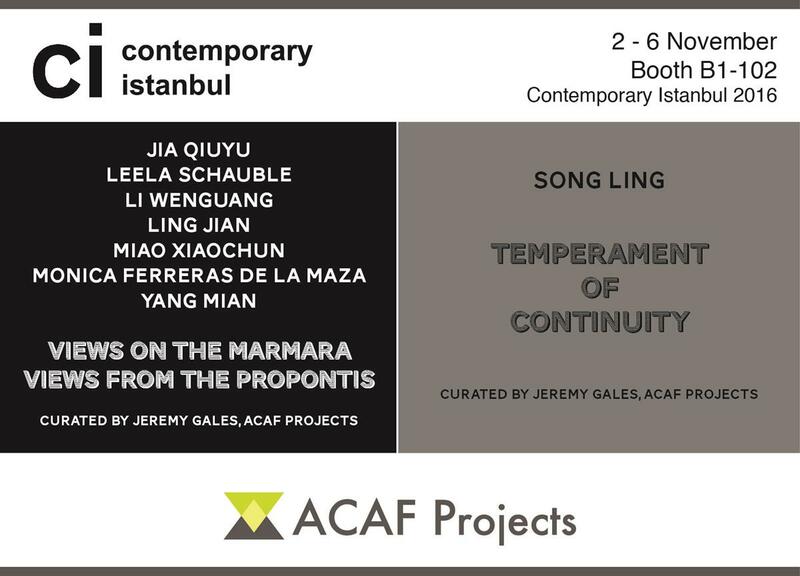 At the 11th edition of Contemporary Istanbul, ACAF Projects presents a group show Views on the Marmara, Views from the Propontis between 2 and 6 November 2016 in Istanbul. Ling Jian will be familiar to visitors attended Contemporary Istanbul last year. Ling Jian uses his photorealistic paintings of idealised Chinese women to highlight the changes to the modern mores in China and the world in general. 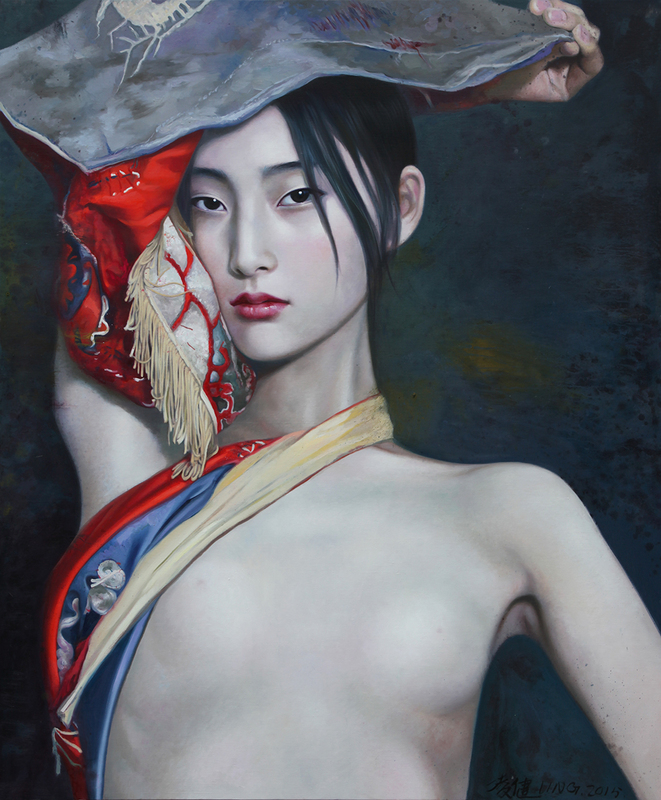 Ling Jian's work accentuates and subverts what we perceive to be quintessential Chinese female identity and form. A person re imagined by another, in response to societal expectations. The oil on canvas are striking and ironically beautiful at the same time. Chinese artist Jia QiuYu’s contemporary ink on paper borders on the conceptual in nature, dealing with the metaphysical, what lies within and outside. Jia Qiu Yu’s work recently featured in the “Charm of Ink and Wash” exhibition at the recent Los Angeles Art Show highlighting the new development in an ancient traditional technique. Jia focuses on faces and the interrelationships their form reveals. Yang Mian, known for his development of a CMYK technique where colour is reduced to the “C” for Cyan, “M” for Magenta, “Y” for Yellow and “K” for Black of the industrial colour printer. 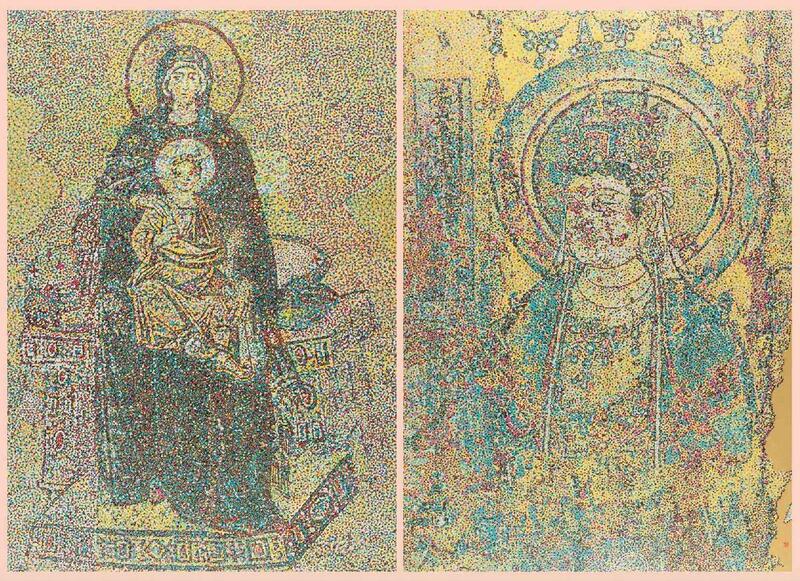 In the works exhibited he takes an image of Christ from the Hagia Sophia and one of Buddha, both from around the 16th Century and reinterprets them with his CMYK technique. His aim is to get us to look at even the most traditional concepts in a contemporary way. 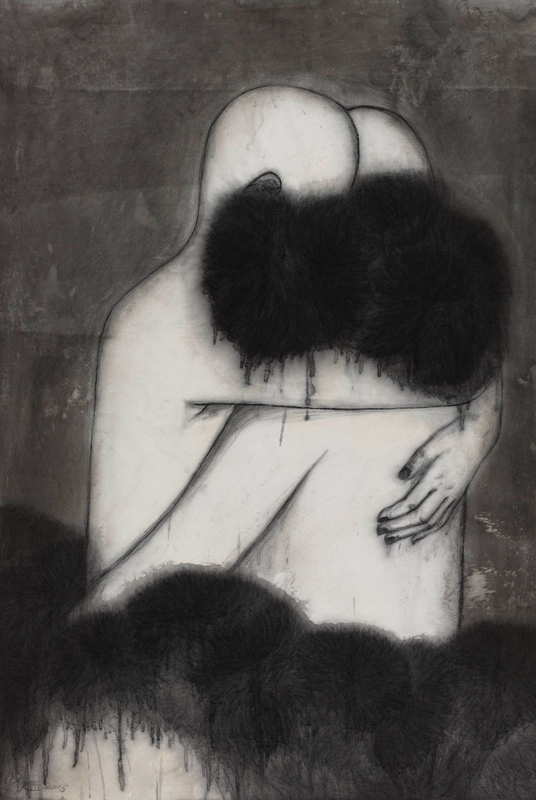 Swiss based Dominican born artist Monica Ferreras is exhibiting with the Australia China Art Foundation for the first time. 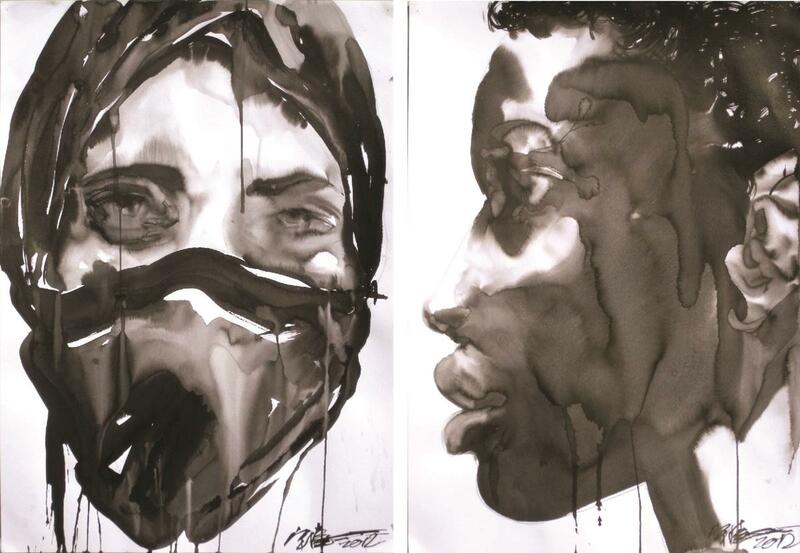 Ferreras abstracted works on watercolour paper are created using a combination of ink, graphite and water colour pencil. Similar to Jia QiuYu, Ferreras work delves into the psyche and cognitive ecologies of memory and recall. Her work uses organic forms in geometric constructions to look at how we use fragments of memory to reconstruct reality for ourselves. Her vibrant paintings bring the energy of her homeland to the analysis of an essential part our our concept of self. The geometric abstraction of Li Wenguang’s conceptions, the hues and tessellations bear resemblance to ottoman patterns. Yet the acrylic and ink works derive from the East, systems within systems, Li Wenguangs tenacity is present in his work. Two participating new media artists Miao Xiaochun and Leela Schauble offer much in the way of diversity, ranging from medium to theme. Each of the artists are strikingly different in style, yet they share similar concerns. Leela Schauble’s oeuvre has sought, more often than not, to address the human condition, yet her more recent work is exploring the human impact on the environs in which we live. Miao Xiaochun is widely regarded as both a progressive and dynamic new media artist. Limitless, Mao Xiaochun’s submission reimagines the renaissance in a contemporary sense, questioning the binaries of East and West. Miao's video work was presenetd at the 3rd edition of Plugin at COntemporary Istanbul last year. The Australia China Art Foundation seeks to facilitate the cultural exchange of international artists on the world stage, Views on the Marmara, Views from the Propontis seeks to carry this on. Li Wenguang’s practice in artshouldn’t be taken simply as an exploration of abstract forms and languages.Those varying geometrical structures, created out of divisions, repetitions andoverlaps in a regular grid, are more like aninternalizing practice withabstract-image texture and rational dominance. With a complicated and trivialprocess and a huge amount of work, the artist tries to fulfill his own plan asprecisely as he can through cartographical and assistant painting with a scale,and to meet the truth in the plan in amechanical working method. However, everyerror in the drawing or even every mark left by a mistaken overlap of strokesis a gift to senses and poetry. These elaborate and powerfulschemas, after some overlaps and repetitions, becom every easy for viewers toassociate with the common decorative patterns in life,such as those of stainedglass or ceramic tiles, which can both be transformed into visual forms as away into the work and become an index to arouse the viewers’ imagination andaesthetic perception. Schauble is a video and sound artist confronting the complexities of responding to a totally new and alien environment. 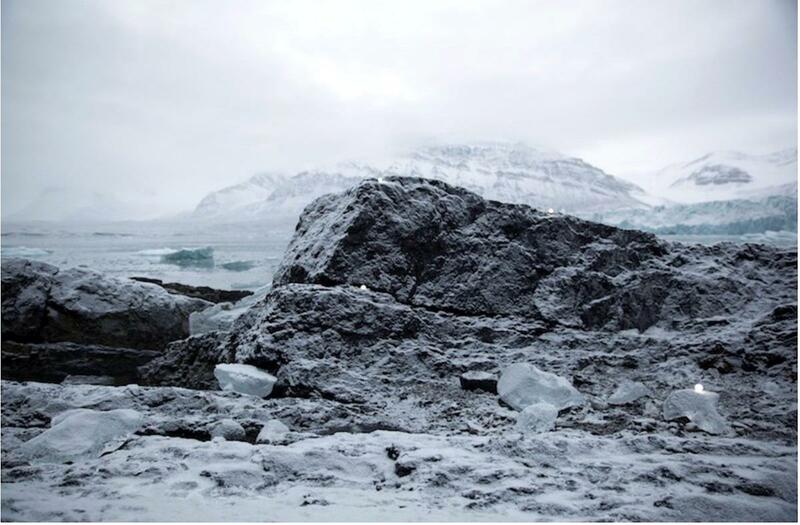 Based on the recent participation as an artist on an Arctic Circle Residency research vessel her work “Signals” aims to stir viewers out of their habitual way of looking at and understanding the natural environment. To look where we have looked before but in a totally new way. Signals is a reflection on the complexities that come with visiting a new environment, understanding it, and taking from it. As a way to comprehend such a still and quiet space. Schauble placed LED lights within the Northern landscape to begin a dialog, as if to allow a line of fluid communication. By working with light signals and subtly skewing the everyday visual interactions, the goal of these works is to stir audience out of a specific habit of seeing and understanding a natural environment. Schauble's practice is often an inane discovery, of looking where humans have looked before, but with new perspective and more focus. What emerges from her video works is an unavoidable momentum towards re-understanding the natural world. Schauble is selected to participate in the 4th edition of Plugin, the video art selection for the Contemporary Istanbul. Dedicated to showcasing artworks at the intersection of science, technology, politics and art, Plugin is now in its 4th year, running alongside Contemporary Istanbul between the 3rd and 6th of November 2016 at the Istanbul Convention and Exhibition Centre (ICC) and Istanbul Lütfi Kırdar International Convention and Exhibition Center (ICEC). This year, Plugin takes up the idea of Networked Space not only as a curatorial concept, but also as a mode of artistic production and point of inquiry into our social imaginary and consciousness. The subject of networks is approached as an epistemological question, investigating the structures of our digitized reality to allow for a renegotiation of the relations between physical and cognitive spaces. Information technologies have triggered economic and societal changes that have led to a radical reorganization of work and production processes as well as of space and communication. Networked Space attempts to offer a multitude of perspectives with regards to signification, materiality and knowledge creation. When an artist paints they are not just in dialog with the medium or other artists of that genre, they are in dialog with themselves, and every work they have ever produced. The linkage between the body of work presented in this exhibition and the artistic career of Song Ling is both linear and conceptual. Underpinning what can only be described as the process which lead to the creation of these new works, is the idea that painting is able to capture both the fruition and dematerialization of our life cycle and everything it consists of. It is with ink and brush, that one is able to capture the ephemeral and render it immutable. The aforementioned linkage is prevalent in Song Ling's choice of medium, ink on water colour paper is a process which he attributes to that of his own childhood, one of experimentation, action and dynamism. The ambiguity of the ink and its ability to embody the traditional on a contemporary canvas allows for more experimental manipulation, than if one were to use ink on rice paper. This ideally achieves Song Ling time to view his own structure. This manipulation correlates to that of the found imagery in the portraiture by the artist, a correlation which is then offset in this exhibition by the display of landscapes. The tapered forms and partially abstracted dimensions are the result of Song Ling's continued efforts to explore what is unchartered in the context of his own practice. Aesthetic not as perfection or destination, but as exploration and understanding. Song Ling calibrates both canon and genre, in which he finds a nuanced, contemporary body of work, one that is as rich in experimentation as it is in result. The works presented in the exhibition at Contemporary Istanbul 2016 differ quite significantly to Song Ling's earlier ink on water colour which was more surrealist in nature, consisting of sweeping strokes and infused with bright hues. Song Ling lives and works in Australia and China and was born in Hangzhou, China. He holds a Bachelor of Arts from China National Academy of Fine Arts. He has been exhibited internationally since 1985 and played a pivotal role in shaping China’s post cultural revolution contemporary art scene, by helping to found the the new wave movement and also by also being a member of the Pond Society. Song Ling has previously been exhibited by the Australia China Art Foundation throughout 2012-2015. In 2015 Song Ling’s work was the subject of a major retrospective at the Zhanjiang Art Museum. Contemporary Istanbul will take place between 3-6 November at Istanbul Congress Center (ICC) and Istanbul Convention and Exhibition Centre (ICEC). The 11th edition of the fair includes artworks from both established and emerging galleries, bringing a regional and international focus to the dynamic contemporary art scene that has developed in Istanbul in recent decades. Notable for its unique position both geographically and culturally, CI prides itself on bringing together galleries, artists and collectors from Turkey, the Caucasus, the Black Sea, Russia and the Middle East, as well as from Europe, America and Asia. Contemporary Istanbul is supported by main sponsor Akbank for the 10th consecutive year, continuing a shared vision for supporting the arts and delivering artistic excellence and diversity, as international and regional interest in the art fair continues to grow. Istanbul has been home to different civilizations and cultures over the ages and has preserved its cosmopolitan and metropolitan structure that has been home to people of different faiths, languages and ethnicities. As the hope chest of civilizations, İstanbul is the capital of the world, in a sense; it is a city that connects Asia and Europe. As one of the most energetic cities in the world Istanbul continually gets to be an attraction center, along with becoming one of the biggest center for contemporary art.